Business Growth South Wales Awards 2018 – Winner of the Visionary Leadership Category. The Business Growth Awards are to recognise and celebrate outstanding achievements across key areas of business growth in South Wales. It was held on Friday 9th March at St David’s Hotel in Cardiff – sponsored by ION Leadership. We are delighted to announce that Penguin have recently won the MoneyAge Financial Adviser of the Year Award 2016. This is our first national win and we are absolutely delighted and would like to thank you all for your kind wishes and positive thoughts. “We are absolutely delighted. The MoneyAge award aims to recognise a firm which shows a true understanding of the advice market and puts clients at the heart of everything it does. With our upcoming book – The Wealth Secret – about to be launched, we have continued to show our commitment to helping more people make better financial decisions. The firm has taken on more junior staff over the past 12 months, through schemes with local universities. We became the very first Welsh firm to be approved by the Chartered Institute for Securities & Investment (CISI) as an Accredited Financial Planning Firm. The CISI awards this title only to firms which it has assessed as demonstrating the highest professional standards of Financial Planning service and advice to its clients. To successfully meet the criteria for approval, here at Penguin we have had to demonstrate that we provide a comprehensive Financial Planning service to YOU – our valued clients. We also had to demonstrate commitment to the CISI’s Code of Ethics and Practice Standards, as well as being tested on Financial Planning Skills at an Advanced Level. Very few Financial Planning firms in the UK can meet these exacting standards! Penguin’s processes have been Independently accredited against British Benchmarks demonstrating that our clients are at the heart of our business. BS 8577 is the only professional quality standard within Financial Services to focus solely on key areas of business practice. Penguin undergoes an annual independent assessment to ensure that we continue to meet the high specification set by the Standard and to achieve re-accreditation. As of the 1st May 2013 Penguin are one of less than 15 firms in the UK to have achieved this Kitemark standard. Chartered status allows firms to demonstrate their professional commitment to raising standards of knowledge, capability and ethical practice. Mike Carberry had the honour of being named ‘Group Pensions Adviser of the Year’ at the 2015 Financial Adviser Life and Pensions Awards. He was absolutely delighted to receive the award at an exclusive ceremony organised by Financial Adviser Magazine (the Financial Times professional publication), on London’s Savile Row. It was an incredibly proud moment for Mike when Dr. Ros Altmann CBE – leading UK pensions expert and campaigner – announced that he had won this prestigious accolade! We are delighted to announce that Penguin were named ‘Pension Adviser of the Year’ at the Unbiased.co.uk Media Awards 2015. The Unbiased.co.uk Media Awards reward excellence from advisers and journalists for their work in the media. Craig Palfrey was on hand to collect the award at the prestigious ceremony in London. 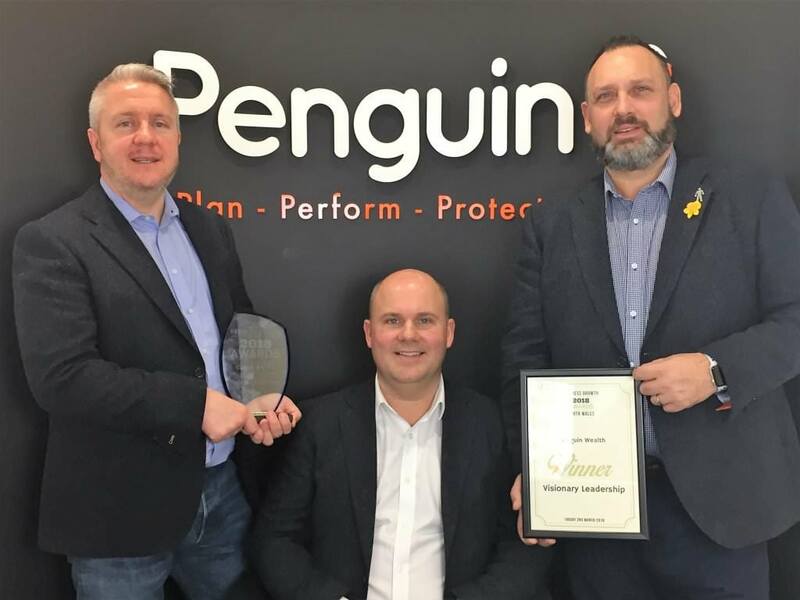 One of Penguin’s proudest moments was being recognised for all our hard work, qualifications and the level of advice we provide to our clients through winning ‘Wales Financial Planning firm of the Year’ at the Professional Adviser Awards 2014. It was the first time Professional Adviser has split its adviser awards geographically, and it was the most testing entry criteria yet, involving a questionnaire, case study and, of course, the scrutiny of an independent judging panel. We are really proud of the award. We were also recently voted the Top Rated Firm in Cardiff by VouchedFor. For those of you who haven’t left us a review yet, VouchedFor is a system that allows people to find Financial Advisers in their area. Clients of the advisers can leave reviews and rate the adviser, so that potential clients can make an informed choice. It’s like a Trip Advisor for Financial Advice! Our advisers have had such great reviews recently that we were rated the top Firm in Cardiff. Another achievement we are very proud of.